Hazlitt said it would fail. He was right. Henry Hazlitt was a leading editorialist for the New York Times from 1934 until 1946. His career at the paper, however, abruptly ended because of the articles collected in this book. 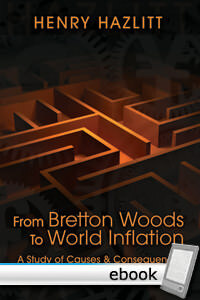 He closely covered the Keynesian-inspired Bretton Woods Agreement of 1944, He wrote that the attempt to fix exchange rates and peg world currencies to the dollar which in turn was fixed to gold would not and could not last..
Hazlitt saw that this was not a real gold standard but a complete fake. It did not offer convertibility in a manner that would instill monetary discipline. It trusted governments to maintain a sound money policy with no means of guaranteeing that they would do so. He said, then, that this was not a viable system, and predicted its complete breakdown in time. Instead, he urged that every country be responsible for the soundness of its own currency. Only that system would produce stability of over time. He said that the result of trusting governments and tying their fates together would be inflation and the collapse of what remained of sound money. Sadly, it didn't last. Tremendous pressure was applied to the New York Times to stop opposing the agreement. Hazlitt would not give in, and kept writing and calling it as he saw it. No one could refute him. In the end, of course, he was pushed out, and the paper reversed its stance. But who was right? Hazlitt of course! The purpose of this book, then, is to memorialize his brilliance and document the fact that Hazlitt was correct in every detail. At the suggestion of Hazlitt himself, this book was put together by George Koether, who worked in the archives for months to gather all the documentation of how this great journalist of liberty went about his work. It includes a detailed narration by Koether himself. It ends with a wonderful epilogue written in 1983. Hazlitt urges an end to inflation by a simple step: stop inflating! He furthers urges the establishment of a genuine gold dollar. Hazlitt finishes with an intriguing suggestion: "We could of course return to a merely private gold standard, but this is likely to happen only by default, when the paper dollar has become worthless, and millions of Americans have been ruined."